The People's Alliance for Democracy (PAD) is a political pressure group in Thailand. 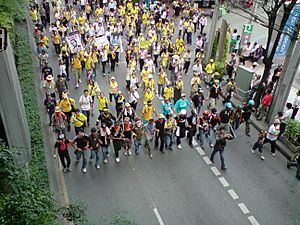 It was originally a coalition of protestors against the government of Thaksin Shinawatra. It called for the resignation of Shinawatra and two later prime ministers, Samak Sundaravej and Somchai Wongsawat. It is also called the National Liberation Alliance or the Yellow Shirts after the colour of the clothes they wear. It started from accusations of fraud against Shinawatra's business deals. In November 2008, the PAD seized Donmuang and Suvarnabhumi Airports to force Prime Minister Somchai Wongsawa to resign. The airports had to close. In 2011 they camped outside Government House for almost 200 days to protest about government policy. Supporters wear yellow shirts with a hat that has a Latin message liberate (Thai: กู้ชาติ). They wear a blue scarf and they use tools that to make the sound like clapping hands (Thai: มือตบ). The People's Alliance for Democracy laid siege to and has occupied the Government House since 26 August 2008. People's Alliance for Democracy Facts for Kids. Kiddle Encyclopedia.